33 women artists March 7-17, 2013. In Women Together, a 5x5 ft oil painting, artist Betty Myers shares her vision of women united for change. Organizers Betty Myers and Joan McHardy share their vision of equality for humanity through the positive power of women working together. Each of the 33 artists in the exhibition has created an image of a woman or a girl. Several hundred people attended the exuberant opening on March 8 at the Arts Centre at Cedar Hill. Keynote speaker Michelle Jacques (left) new chief curator at the Art Gallery of Greater Victoria, spoke on the theme: Our Diversity Makes Us Stronger. Michelle Jacques praises the collaborative spirit of the event and diverse participants. Women of all cultures, abilities and ages are included. International Women’s Day focuses on the achievements of all women. “Yet these contributions are thwarted every day by lack of opportunity and respect,” she notes. The curator believes ending violence against women is a global priority, seen recently in the One Billion Rising demonstrations. EACH OF THE 33 ARTISTS IN THE SHOW IS SPECIAL. BECAUSE OF LIMITED SPACE ONLY 8 ARE PROFILED BELOW. 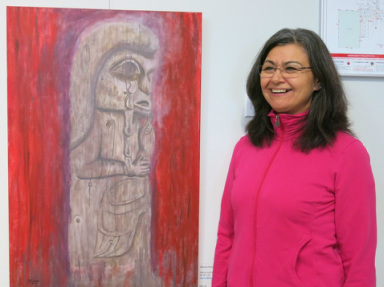 Patricia June Vickers Ph.D, is from the Gitxaala village in BC and now lives in Victoria. “Weeping Woman with Grouse” records an extant pole in Kispiox in Gitsan territory, near Hazleton. The pole tells a sacred story (adaawx) owned by hereditary chief Walter Harris. The women is weeping because her people are starving and the red background suggests emotional fire. As a mother, grandmother, scholar and teacher Patricia employs transformative methods to ease collective and individual suffering. While attending a lesbian Passover Seder last year, Annie became interested in the matrilineal ancestry in her family. Thinking about her own grandmother, who died when Annie was six, led her to unravel some meaningful messages in the family tree. 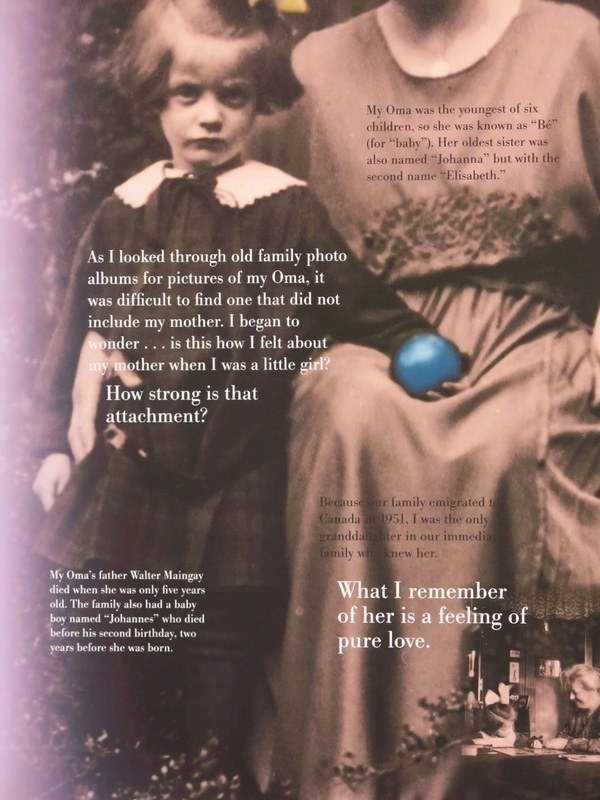 The prominent photo in the collage features Annie’s mother as a young girl, with her own mother. “I see my own anger and sorrow at the separation in my mother’s face” says the text on the collage. Annie feels closer to her ancestors by moving back in time. “They seem like real people to me now,” she says. With just a few memories, facts and photos Annie created a relevant story that resonates through the generations. Sue Hara (right) is a well-respected local potter with many years experience. A gardener, floral designer and member of the Ancient Forest Alignment, Sue feels passionately about the state of our fragile planet. 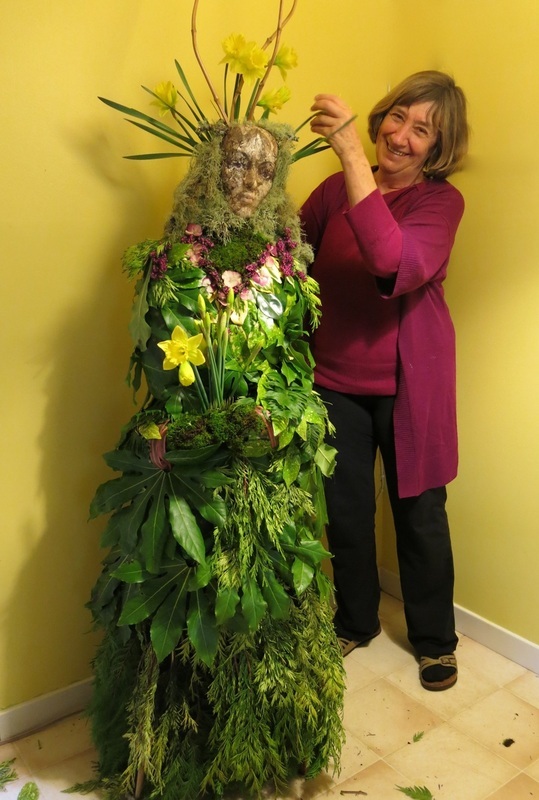 “My Gaia sculpture is a personification of the feminine energy of the earth,” says Sue Hara. Her original idea for the sculpture was a tortured being with a bleeding heart. 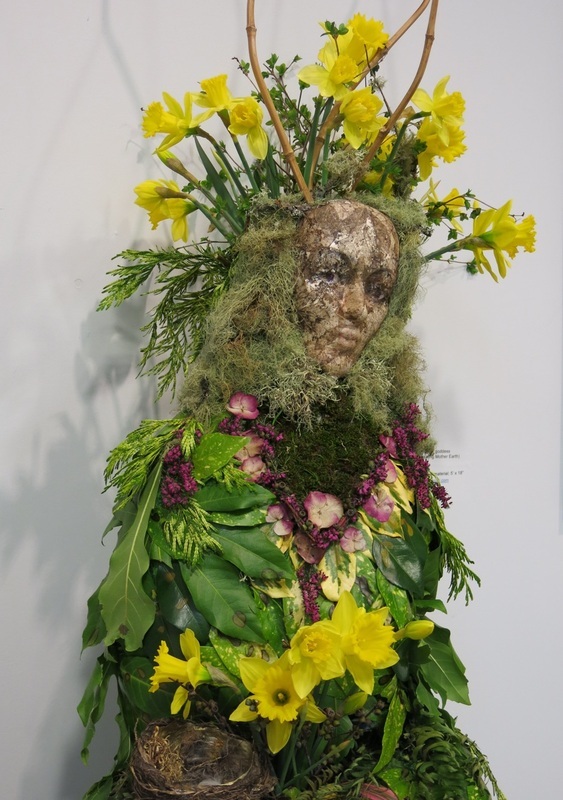 But, while gluing vegetation to the chicken wire and paper mache frame, the earthy beauty of the goddess unfolded. “Then I recalled it was a celebration after all,” Sue says. Avis Rasmussen offers kudos to Betty and Joan for organizing the Women’s Day show. During the 1970‘s, Avis worked on the Royal Commission for the Status of Women, and the Status of Women Action Group in Victoria. “In terms of recognition, women artists have made great strides forward,” says Avis. 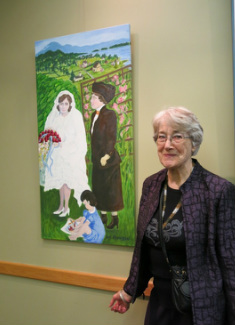 The “matriarchs” in her painting include Avis’ mother in the wedding dress and her grandmother in a serious business suit. Avis is the young child sketching. 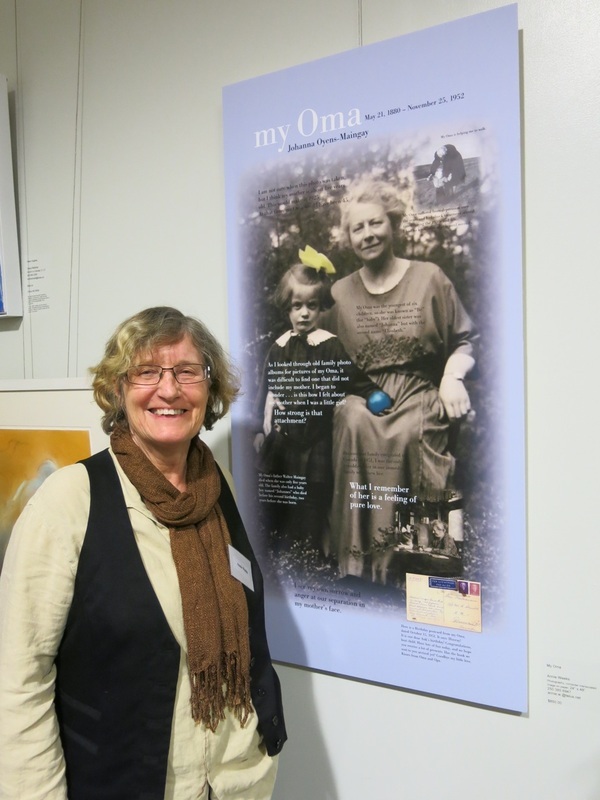 One of the first women to attend school board meetings in Saanich, Avis’ grandmother ruffled some patriarchal feathers. Avis Rasmussen is a printmaker, painter, writer and teacher who has exhibited internationally. Her artworks titled New England Seascapes showed at the Winchester Galleries on Oak Bay in March, 2013. Christine Clark is a visual artist who writes well and blogs often about local exhibitions and artistic colleagues. Eva enjoys taking part in community events and projects. 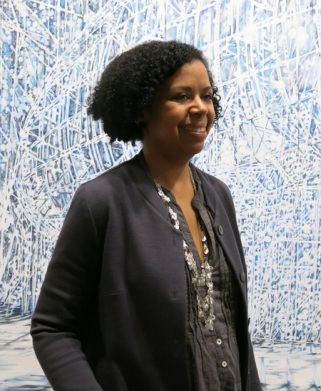 Her painting “Listening and Seeing: Filmmaker Kemi Craig” profiles a fellow artist with whom she directed a short film Routes in 2006. Routes was part of the Voice It! project initiated by the Intercultural Association for anti-racism education. For this show, Christine used two self-portraits completed 12 years ago at the Victoria College of Art. Working intuitively, with materials on hand, the artist used dressmaker pins to adhere the portraits, then added details and a decorative gold frame. Helen Rogak with oil painting Rio and Mary. Helen Rogak is a Victoria artist with 35 years of exhibition experience. The painting honours the hard work and dedication of her granddaughter Mary, who works with horses like Rio. Helen says a big thank you to organizers Betty and Joan for their cooperative efforts on group projects over the years. Sharon White is a fabric artist and member of the Victoria Quilters’ Guild. She is thrilled to be in the company of this wonderful group of artists. Sharon used the technique of Machine Applique to create Voyageur Canoe. 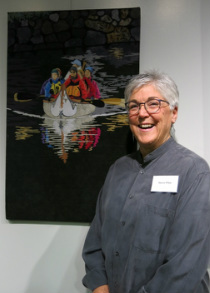 The artwork was created from an enlarged photo of a group of women paddling a voyageur canoe on the Gorge waterway. The International Women’s Day Art Show exhibited in March, 2013 at The Arts Centre at Cedar Hill, 3220 Cedar Hill Road, Saanich. Facility Hours are: 6:30am-10pm weekdays, 8am-9pm weekends.